Here in Utah where it's HOT in summer, COLD in winter & DUSTY year round I couldn't even imagine anyone having jalousie windows. You get great ventilation with them closed! Also, I once owned 2 Bigfoot 10-6 campers at the same time, one a 90's model, the other a 2002, both identical 2500 series except the newer had dual pane windows. Huge difference, especially running the AC in summer. And no frost on the inside of the dual panes, even on the coldest days. Not sure if it relates to FGRV's but I know that when manufactures of modern jetliners started making them they had square cornered windows and eventually they would get stress cracks at the corners. Going to a rounded corner window eliminated that problem. If your Jalouise leaked when closed there were other problems, these windows don't leak if the seals are good and they are installed properly. I do agree with you 100% on the dual pane windows, our Escape has them and they are superior over any single pane for heat, cold and noise. Maxxair has discontinued the Wndowmaxx units and has no plans to reintroduce them. When they first announced that decision, friends of LHC scoured the internet to find every available unit for the LHC shop. Any still out there would almost surely be a lucky find in a local shop. I do not have air conditioning so I would not trade my jalousie's . Luckily Triple E put them on all 4 sides . With new weather stripping when required leaks are not an issue. It has been 40 years and no sign of water damage. I am not an engineer*, but I slept in a Trillium last night. Floyd** in post 17 is correct. One avoids sharp inside corners in designs because they cause stress concentration. Cracks will originate from them. *I was an engineering technician. **Interesting that you use a photo of the De Havilland Comet which was the first commercial jetliner and is notorious for breaking up in flight because of metal fatigue caused by the pressurization/depressurization of the plane and the square window corners. Love the jalousie windows on our 1982. Without AC, they give great cross breezes and this summer we've had them open in several torrential downpours, without a single leak. It does seem that the mechanism in one window will need to be replaced, but totally worth the upkeep for us. 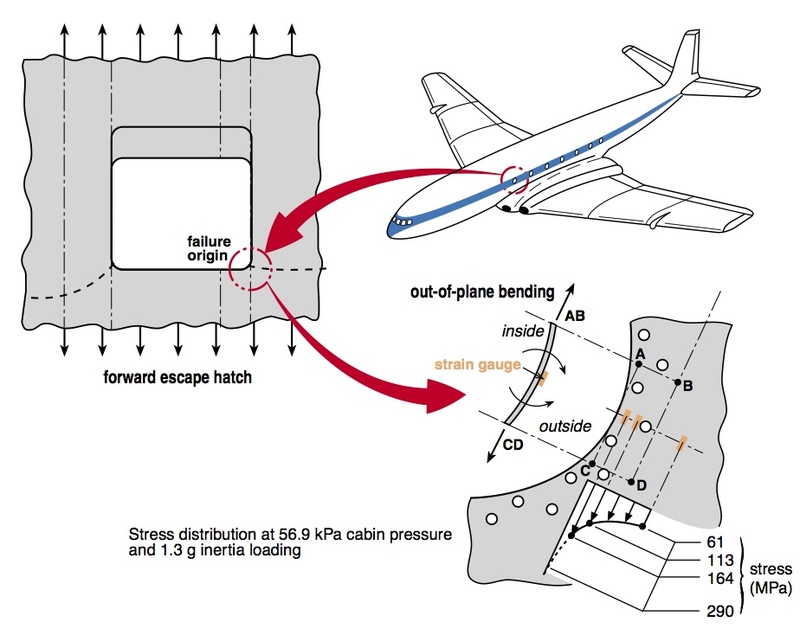 I fully agree that a standard engineering principle is to avoid any sharp corner because it concentrates stress, but that is in a stressed, structural or pressurized structure. If this was an issue on our trailers we would see lots of cracks in the window area of the many Bolers, Scamps, Trillium's, ... that have used rectangular windows for decades. The bodies are not stressed on these trailers unless the frame is damaged. I have never seen a crack generating from the window area, the doorways yes.